You can always remove a grade if you'd prefer not to have one assigned. You can delete grades easily! 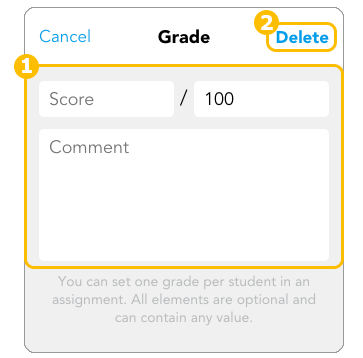 The first step is always to open up the grade popover by revising grades. Next, just delete all of the information in the popover so that at least the Score and Comment fields are blank. Doing this will change the Revise button to Delete. Tap Delete and you’re done! The process is the same for both iPad and the web app, so that’s one less thing to worry about!